Deluxe hotel in the future-oriented new city in Sangam-dong! Stanford Hotel Seoul is conveniently located Digital Media City (DMC), which is about 40min from Incheon Int’l Airport by the airport railway A’REX. DMC is the 21st century future-oriented city where people, culture and nature being harmonized. 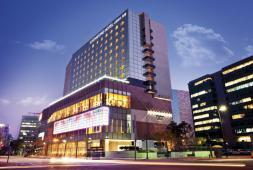 Stanford Hotel Seoul opened in the DMC boasts 239 comfortable guestrooms, diverse facilities and services. The hotel is suitable both for business travelers and sightseeing tourists.